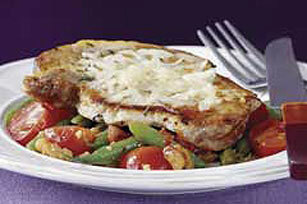 Marinated pork chops are pan-roasted with cherry tomatoes, green beans and walnuts in this awesome 30-minute weeknight skillet recipe. Place chops, 1/4 cup of the dressing and seasoning in resealable plastic bag or bowl; turning to coat chops. Refrigerate 10 min. to marinate. Remove pork chops from marinade; discard marinade. Cook chops in large skillet on medium heat 4 min. on each side. Remove from skillet; keep warm. Heat walnuts in skillet on medium heat 3 min., stirring constantly. Add remaining dressing, green beans and tomatoes; cover. Cook 3 min. Pour water into skillet; stir. Return chops to skillet; cook until temperature reaches 160°F. Sprinkle with cheese. Serve immediately. You can store uncooked fresh pork tightly wrapped in butcher paper in refrigerator up to 4 to 5 days. Uncooked pork can be frozen for up to 6 months.